Archaeological evidences reveal that the Indonesian archipelago has been inhabited since more than 1 million years ago, and homo sapiens arrived in the archipelago around 45,000 years ago. By the beginning of the first millennium, small kingdoms have flourished in the archipelago, benefiting from trade with India and China, which have been established several centuries before. Among these kingdoms, by 7th century CE, the naval kingdom of Sriwijaya in Sumatra had risen into a reckoned force. The next few centuries saw the alternating fortunes of Sailendra and Sanjaya dynasties in Java, which left behind the grand temples of Borobudur and Prambanan. By early 14th century CE, power had shifted further eastward, with the kingdom of Majapahit spreading its influence all over Indonesian archipelago. Meanwhile, Islam, brought by Muslim traders since 10th century CE, gradually became the dominant religion replacing Hinduism and Buddhism. The arrival of Western traders in 17th century soon brought the archipelago into power rivalries between Western powers and eventually into Dutch control, which lasted for more than three centuries in some parts, until Dutch surrender to Japanese forces in 1942. Following the surrender of Japan to the Allied forces, the independence of the Republic of Indonesia was solemnly declared on August 17th, 1945. However, the Netherlands, Indonesia’s former colonial master, was bent on retaking its prized colony either by diplomatic or military means. For more than four years Indonesia fought to defend its independence through two Wars of Independence and intermittent negotiations, until the Netherlands finally recognized Indonesia’s independence. Political and social turbulences characterize the first two decades of Indonesia’s history after independence, under the charismatic President Soekarno. After successfully putting down a coup attempt in 1965, Army’s power under General Soeharto rose and eventually brought him to presidency in 1967. By providing economic and political stability, as well as creating substantial development, President Soeharto was able to remain in power for the next 32 years, an era known in Indonesia as the New Order. 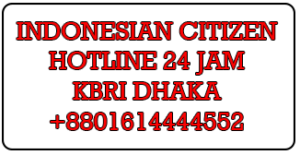 Asian financial crisis in late 1990’s, however, hit Indonesia the hardest and brought down the New Order. Amidst daily mass protests cried for Reformasi (reform), Soeharto relinquished the presidency. The years following the Reformasi witnessed the strengthening of democratic processes and decentralization of government power in Indonesia. Even though volatile at first, the changes brought by Reformasi have built better foundation for a more sound future. Reflecting its long history, Indonesian national symbols are deeply rooted in Indonesian culture. The red-and-white flag is carved on stone panels of temples and described in stone inscriptions of Indonesian pre-Islamic era. 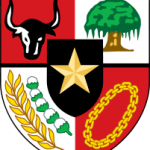 The Indonesian national flag is called Sang Saka Merah Putih or “the red and white treasure.” As provided for in Article 35 of the 1945 Constitution, the flag is made up of two colors, red on top of white. By law, its width must be two-thirds of the length. 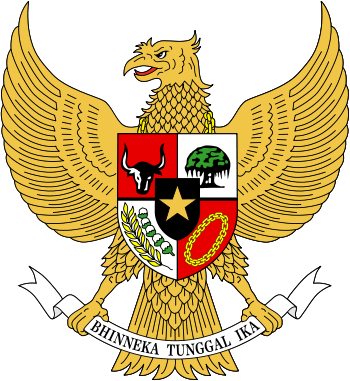 Indonesia’s official coat of arms is centered on the Garuda, and ancient, mythical bird from the country’s historical epics. A great deal of symbolism runs through the Garuda. The eagle is a symbol of creative energy. Its principal color, gold, symbolizes the greatness of the nation. The black color represents nature. There are 17 feathers on each wing, 8 on the tail and 45 on the neck. These numbers stand for the date Indonesia proclaimed its independence: 17 August 1945. The shield symbolizes self-defense and protection in struggle. 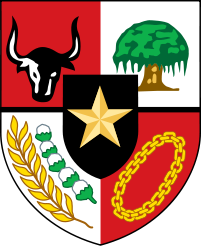 The five symbols on the shield represent the state philosophy of Pancasila. 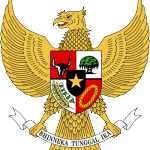 The motto Bhinneka Tunggal Ika (“Unity in Diversity”) is enshrined on a banner held in the eagle’s talons, signifying the unity of the Indonesian people despite their diverse ethnic and cultural backgrounds.